Do you like minimalistic style? Do you have thing for rich rooted Indian tradition and culture? Are you a fan of incorporating artistic details on your outfit? Then you should consider wearing Kalamkari blouse with plain sarees. The aesthetic kalamkari prints needs no introduction. Kalamkari is a type of hand painted or block printed textile used earlier to depict mythological figures, deities, scenes from epics etc. Kalamkari painting has its origin from Andhra Pradesh during the Moguls period itself and has been successfully revived every year to keep up with contemporary fashion. Well, earlier kalamkari work is widely embraced in clothing which is used for curtains and pillows for an artistic feel. However, owing to its incredible beauty, now these classic prints are being used on bags, clutches, dresses, dupattas and even on jutties etc. If you have not blessed so far to try this work on your outfit, we urge you to give it a choice. 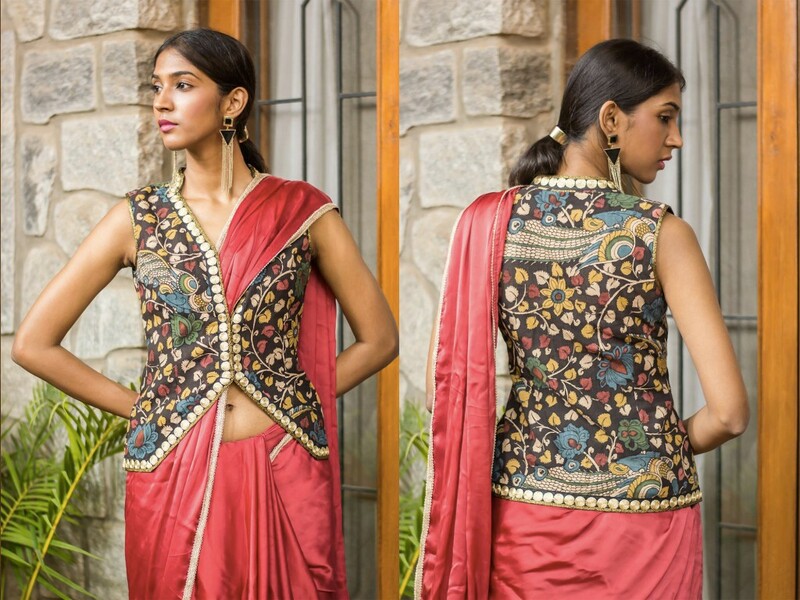 For a beginner, you can just buy a block printed kalamkari blouse and pair it with your plain sarees. 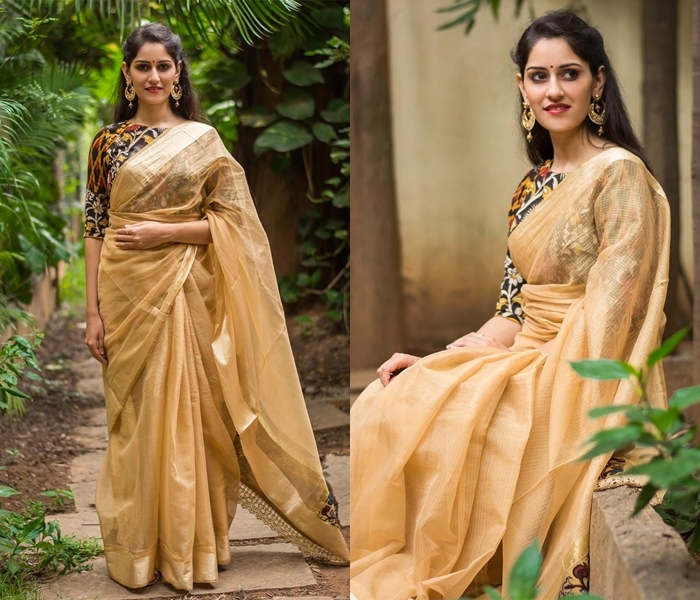 Let’s dive in and check all the possible plain sarees that goes well with simple Kalamkari blouse. Are you a fan of the most traditional kerala kasavu saree? 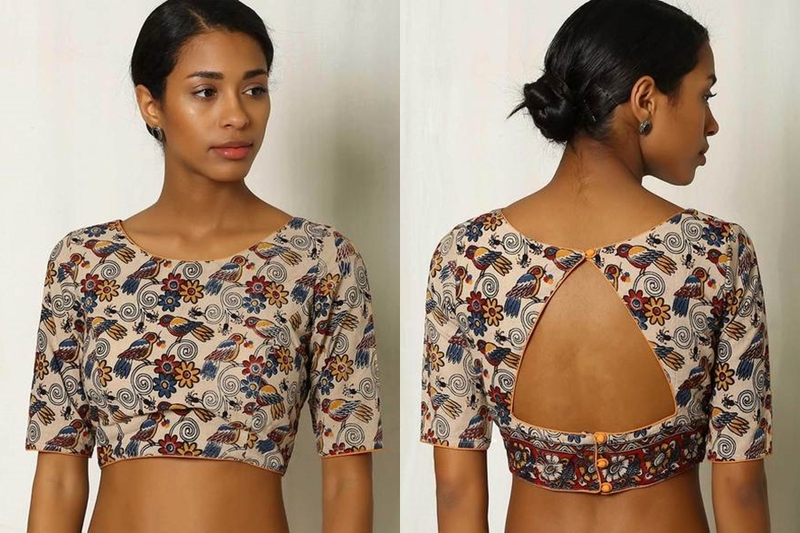 Then give it a try with a kalamkari blouse. The kalamkari prints which are known for its deep hues make a fantastic combination with white and off-white sarees! Cotton saree of any color can be literally elevated to look cool by pairing them with kalamkari prints. For an eviable saree style, go for light color sarees. For example parrot green, baby pink, yellow, orange work wonders with a deep red kalamkari blouse. Bright pink goes well with blue toned blouse. Black and grey hues go well with red sarees. If you pick the right cotton saree, these blouses will increase the beauty to unknown levels. 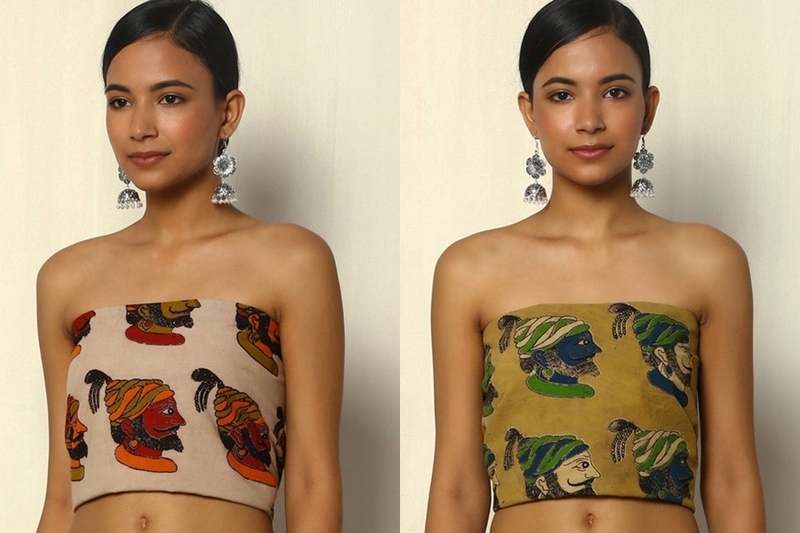 Yes, these artistic prints can even be tested out on light weight monochrome silk sarees. While pairing heavy zari work saree with kalamkari work is not a wise idea, plain silk saree often flare well. If you want to wear with heavy work silk saree, then get more embellishments done on your blouse for a striking look. Plain designer sarees with attractive work on the border can be brightened up further with a right choice of kalamkari blouse. 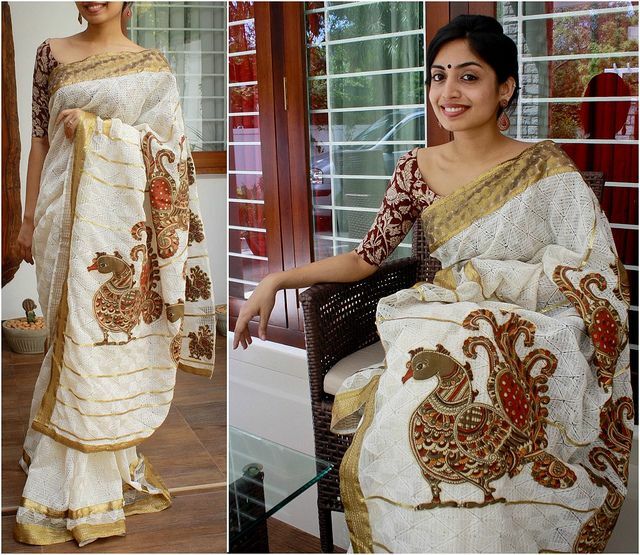 For instance an ivory hue saree with stone work on the borders can be worn with maroon kalamkari blouse. As you might have already guessed, these blouses can double up as good party wear too! Kalamkari prints can even be a fun to pair with your plain georgette and chiffon sarees. 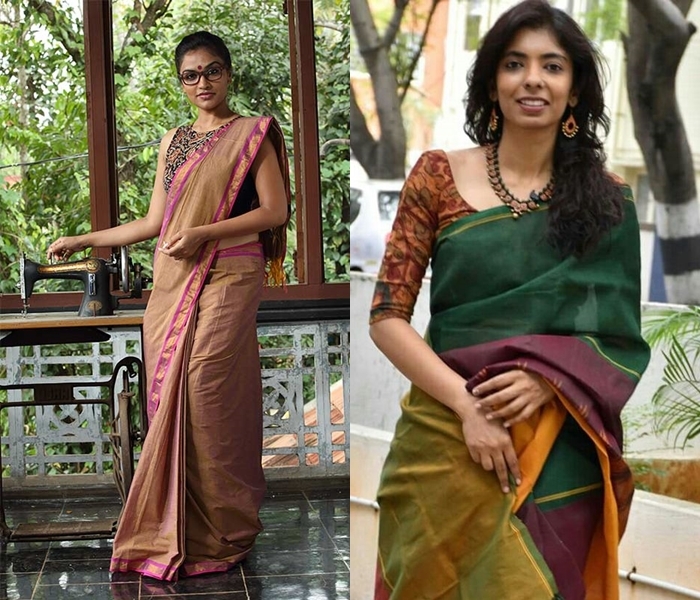 You need to pick the right saree color to go with your kalamkari prints. Generally kalamkari details will be on the natural non-synthetic colors, so pairing them with earthy hues can be an ideal choice. 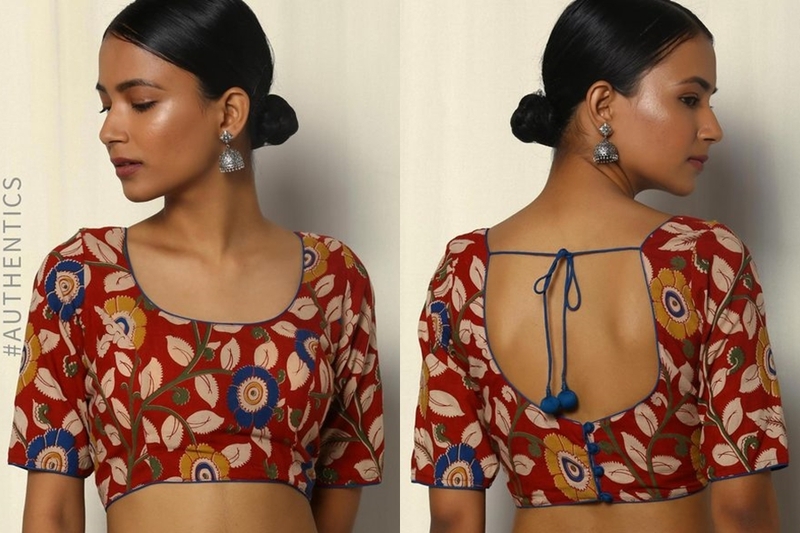 Ok..just because we keep repeating the word kalamkari over and over here, it doesn’t mean you need to shop the first design that hits your eye. Before making any shopping please do take the time to check out all the possible kalmkari work that is being done on blouses. So you will be well informed before buy one! Now let’s see some famous kalamkari prints/work that will make other pronounce that you have indeed a classy blouse on you! 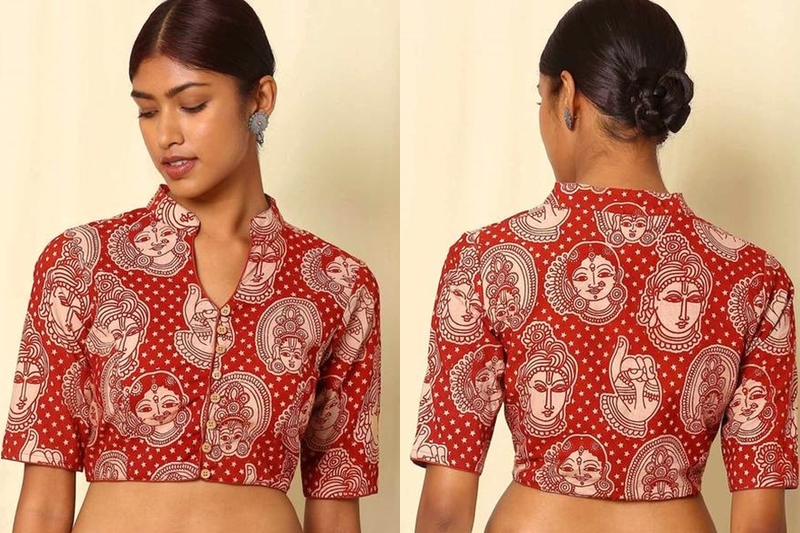 Ancient figures are the most popular kalamkari work on a blouse. These bold works instantly infuse an ornamental feel to your saree. Instead of crowding the blouse with too many details, these bold prints will be a stand out pattern to try! Leaves are another widely used pattern on kalamkari blouse. Deep hued blouse filled with much lighter color leaves will be an elegant one to wear. If you like to garner attention with the first sight of your saree, then pick a blouse with the most aesthetic Buddha prints all over. It is sure to steal the show. 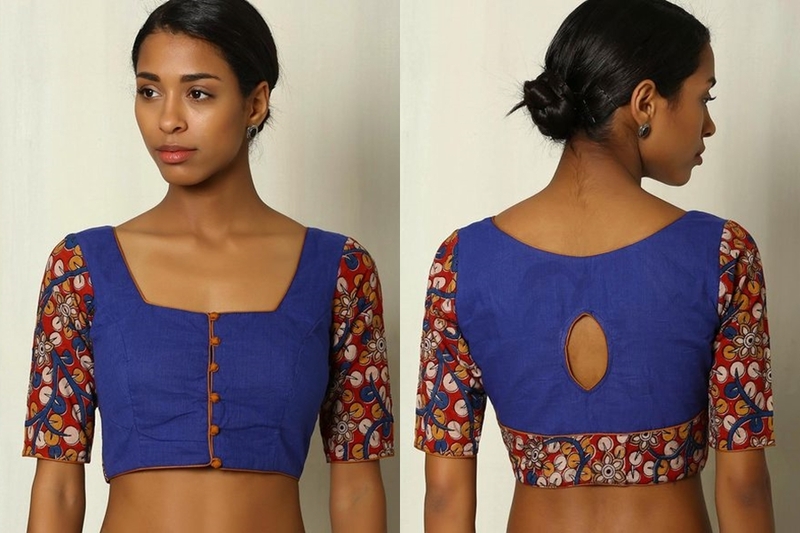 Imagine the below blue blouse with a simple off-white saree, you will be spot-on. Often unique prints like homes, villagers, trees, fields, human beings will also be done with the touch of Kalamkari work. They look so down-to-earth, yet majestic on a saree blouse. Do pick this one, if you can find on any shop. If you don’t mind shopping online, we have given you the shopping link at the end of the post. Who will not forget the beauty of flowers? Floral have a way to invade the clothing territory by some mean. And these gorgeous kalamkari prints have no option either. Simple floral work on deep hues can look refreshing to try on your plain sarees. Make your blouse an illusionary park with the addition of fine bird prints. Make sure your blouse color is light, so the bird prints looks distinctive. 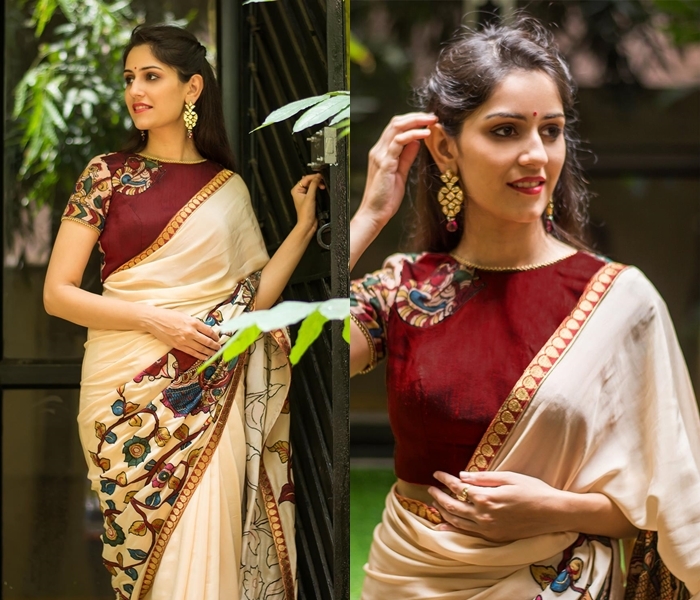 Imagine wearing your plain raw silk saree with a blouse design as below! Don’t you think even the heavy work zardosi and stone blouse would bow before these beauties. Yes, kalamkari blouses with instruments prints are for those who place creativity above anything. Just like birds, bold animal prints are popular in kalmakari work. War elephants, horses, deers, rabbits and what not! They all have a defined place in kalamkari art. Bold face of kings, queens, and even gods are quite popular on Kalamkari work. If you are about to head an auspicious occasion or a heritage event, nothing can beat a simple cotton saree with these prints. 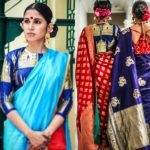 We have seen all the interesting work you can choose for your kalamkari blouse, now it is time to design your blouse in such a way that it don’t comprises on the other fashion aspects. Why you should give focus on your blouse style, you may ask! Remember you are about to pair your plain sarees with this. 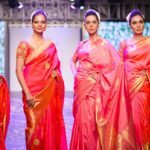 So you need to make sure that your blouse style remains significant to balance the plain look of your saree. Some may feel these prints are crowding the blouse and makes it lose its essence of appeal. 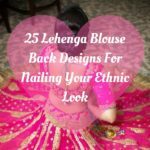 In such cases either you can opt for sparsely printed bold work or you can opt to have the designs only on your sleeves and at the back as below. Another way to stitch your blouse especially if you are conscious of crowded looks is by having the design only for half of the sleeves. 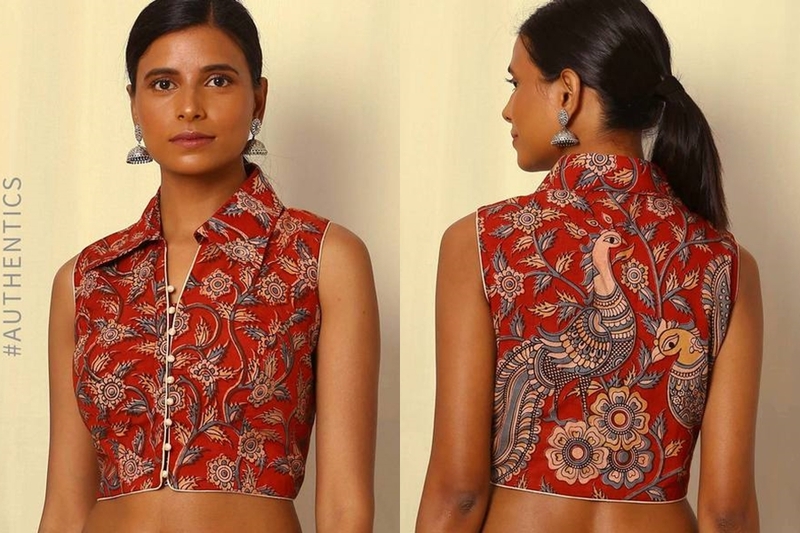 This way you can subtly highlight your kalamkari work on your outfit. To meet the needs of festive saree look, you can even get some embellishment done on your blouse like below. Especially when you like to pair your blouse with party wear sarees, a fine adornment like below is sure to balance out the saree. Add tassels, potli buttons and other creative details on your blouse to make it look more pleasing. Having kalamkari prints highlighted with color blocks on your blouse is another interesting way to elevate the blouse style. Often detailed kalamkari prints might get its lost amidst the heavy prints. Stitching the blouses as below will solve the issue and make your blouse super stylish. It is not grounded principle that you should wear kalamkari as a standalone cotton blouse with your sarees. Alternatively you can try them with other pleasing fabrics and see how magical it can get further. 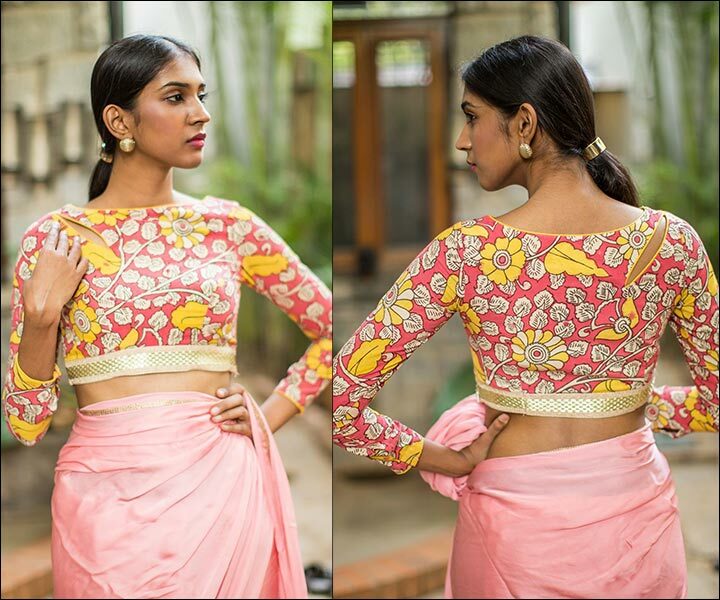 Here below is an inspiration on how to try kalamkari prints on other fabric. The below one is a vibrant mangalakiri cotton with sleeves printed with fine kalamkari work. If you want to introduce kalamkari to silk sarees, then please give ikat blouse a try. 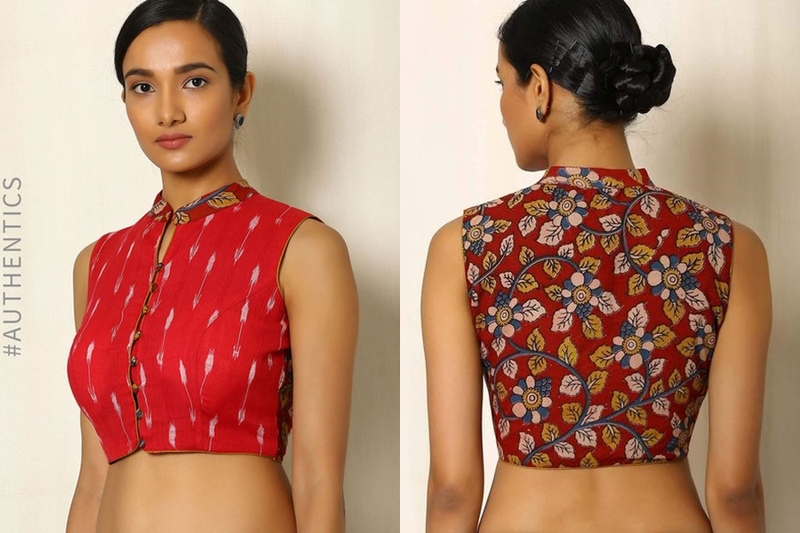 Silk ikat blouse with detailed kalamkari work at the back can make you a showstopper any day. Chic boat necks, collar necks and wide front & back necks are great way to make artistic kalmkari blouse trendy and sophisticated. This way you can pair them easily with designer sarees too. Also experiment with your sleeve style. If you want to pair your blouse with crisp cotton sarees, try elbow length blouse. 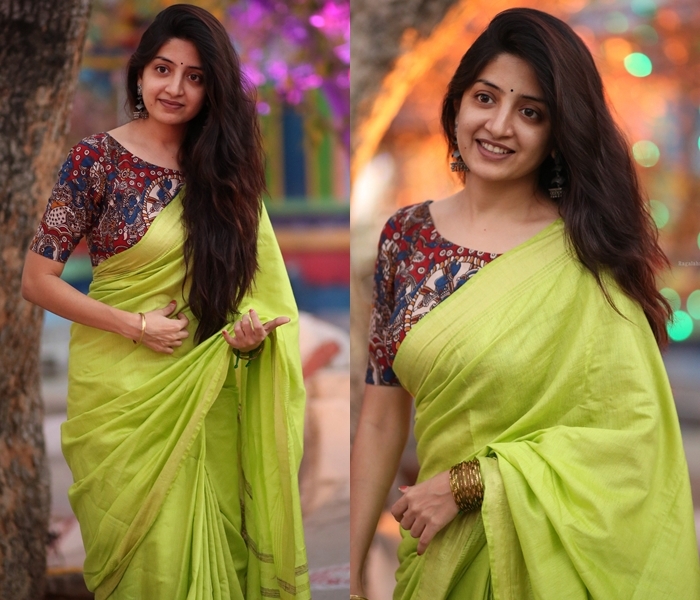 If your saree is on a flowy fabric, then wear it with long sleeve blouse. For a glam look, go sleeveless. 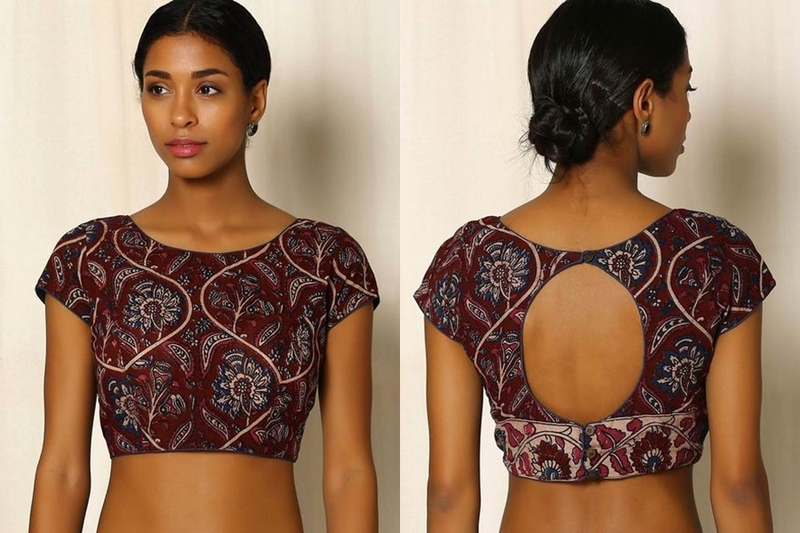 These are few design options you can focus when you about to get your kalamkari blouse. 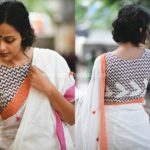 We hope you have gathered enough inspiration on how to get the best of this artistic blouse, and also how to pair them with your plain sarees. If you like to own these blouses, you can SHOP BLOUSES online here. Let us know your ideal way to wear kalamkari blouse with sarees by using the comment box below! You Might Regret To Miss This Artistic Blouse Style! 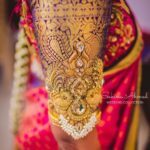 Previous articleA Guide To Pick Latest Gold Jewellery Designs For Weddings!